For many of our clients in the fishing industry, they are looking to further brand their business. By customizing the Rod Gloves with your logo, you can offer your team, or customers a chance to further promote your business. The Rod Glove can customize your Rod Gloves with your own logo so that you can promote either your business or group. Offering the print in either black or white ink, your personal logo can be printed on either the bell collar or sleeve. 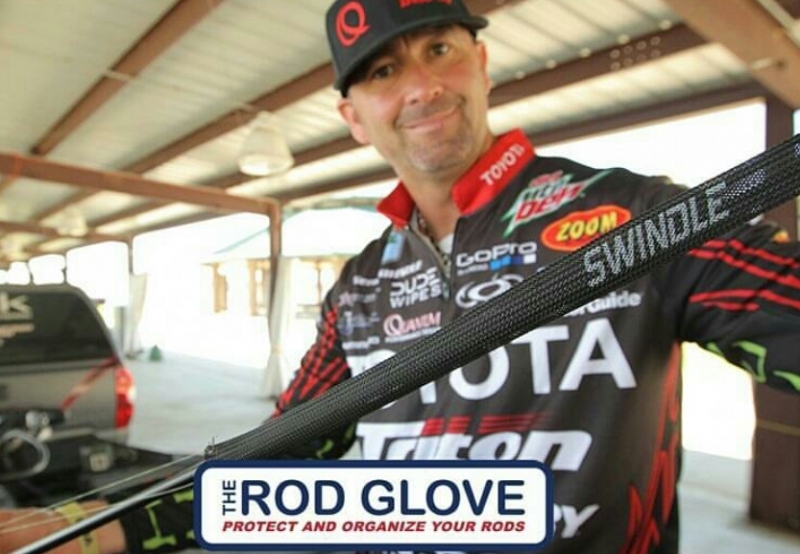 This means that not only will the Rod Gloves offer protection for your rods but they will offer promotion as well. We have worked with many large companies in the industry and if you look closely at the tip end you will find the Rod Glove printed on the tips and know that it is one of the best products in the industry. The tapered tip is what sets the Rod Glove apart from the rest as this is where the rod tip fits snug and protects it against snapping either while travelling or while in the rod locker. Many of our Pro Bass Elites have custom branded Rod Gloves with their names printed on them and Gerald Swindle is not only the face of The Rod Glove packaging but has had custom branded Rod Gloves with his own name on them. Be sure to check with your boat supplier when you make your purchase as many of our clients include the boat manufacturers such as Triton, Ranger, Nitro Boats, Bass Cat, and Tracker to name a few. With so many anglers on tournament day at the boat launch, branded Rod Gloves will at least differentiate your gear apart from the others and what better way than to have it match your boat. The Rod Glove sponsors Kickin Their Bass TV a young enthusiast angler that decided to get some branded Rod Gloves to help promote his social media outlet. Noah talks a bit about what makes the Rod Glove products so unique. Take a look at the video that he created. The Rod Glove last longer as I was using another brand and it unravelled. The Rod Glove is good quality and they have not torn or have not worn out, as they are built to last.